What to do when "the lettuce is out of control" | eat. live. travel. write. What to do when "the lettuce is out of control"
Here’s a guest post to kick things off over the next two weeks whilst I am in Laos. It’s written by my very good friend Cathy who lives in Michigan and who we met in 2001 on a trip through Tunisia. A mutual love of food and reality tv, especially The Amazing Race and Top Chef has strengthened our friendship over the years (oh, plus, they’re lovely!). Back in the spring, one of my neighbors asked if I’d like to join a community supported agriculture (CSA) group she was starting with an Amish farmer about an hour north of where we live in western Michigan. A CSA is basically a farm share coop that asks group members to invest in what a farmer grows. Members paid a small fee in the spring that helped to offset the cost of seeds and supplies, and then throughout the summer, we pay a weekly fee for a set amount of fresh produce. What we get in our bushel baskets depends upon what is fresh and seasonal, as the produce is picked the same day we receive it. Because it was such a cool, wet spring, we didn’t start getting our produce until the middle of June, but once it began, we found ourselves with a great supply of fresh, healthy, locally-grown vegetables each week. I joined with a couple of my girlfriends, and we all look forward to what we’re going to get each week and then share ideas about how we’re going to use it. So far we’ve had lettuce, broccoli, onions, radishes, lettuce, zucchini, strawberries, bok choy, swiss chard, lettuce, rhubarb, and more lettuce. Seriously, the lettuce is out of hand. We are overrun with lettuce. Red leaf, butterhead, green leaf, romaine, bibb . . . I can hardly keep track. All I know is that I’ve had to find some way to get my family to eat all of these terrific greens. The solution has been homemade salad dressing, specifically ranch dressing. 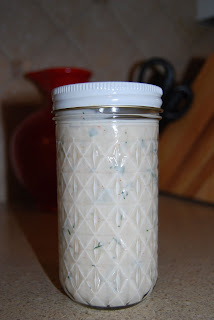 Not the goopy,artificial-tasting bottled stuff you might get at the supermarket, but fresh, herby, yummy homemade ranch. This stuff is so good, you’ll want an extra helping of salad, just to have a little more dressing. And a nice bonus to it is that if you have kids, and if they’re anything like mine, i.e., not exactly big on the leafy greens, a little ranch dressing goes a long way toward getting them to eat a salad with dinner. Now, let’s make some salad dressing . 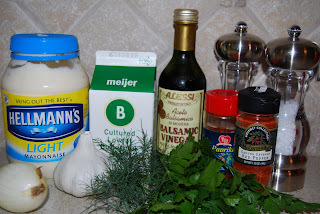 . .
For a basic ranch dressing, you’ll need light mayo, buttermilk, vinegar, garlic, onion, paprika, cayenne pepper, kosher salt, freshly ground pepper, and fresh herbs. If you don’t have buttermilk on hand, you can certainly “make” your own by combining a cup of milk with a tablespoon of lemon juice or vinegar. The combination of the milk and the acid will produce a buttermilk like flavor, although I’m partial to real buttermilk because of the thicker consistency. In a pinch, however, the milk+lemon juice/vinegar combo works fine. You can also use a variety of different vinegars in the dressing; I used balsamic because it was what I had on hand. Note that what I’ve made here is a bit spicy for the average kiddo; to tone it down a notch, just add less onion, garlic, and cayenne. My girls like it with less of the spicy stuff and more of the fresh dill. 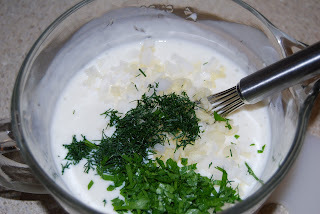 In a small bowl, whisk together about a cup of mayo and a pint of buttermilk; adjust the consistency to suit your tastes by adding a little more of either as you mix it together. Finely chop a few cloves of garlic and a small onion and whisk those into the liquid mixture. Add a handful of chopped fresh herbs, a few dashes of cayenne pepper for some zing, a few dashes of paprika, some freshly ground pepper and kosher salt, and a teaspoon or two of vinegar. Whisk it all together, taste to adjust the seasonings, chill, and enjoy! All of the fresh ingredients have been added . . .
Mmm . . . makes you want to dip a spoon right into it, doesn’t it? And here’s the final product, stored in a clean jam jar to be carried to a friend’s house for dinner tonight. Yum! Now only one more enormous head of lettuce to go before this Wednesday’s CSA delivery . . .
Mardi, thanks so much for letting me a guest poster on your blog while you’re gone. It’s a pleasure, and an honor, to be here. I can’t wait to read about your culinary adventures in Laos when you return! 5 Responses to What to do when "the lettuce is out of control"
Thanks for visiting my site and all the wonderful comments. I must say this ranch looks fantastic…What is the exact recipe? I would love to make it! I knew I liked you Cathy – with your love of the Amazing Race and Top Chef (my 2 fav shows) it is cemented. 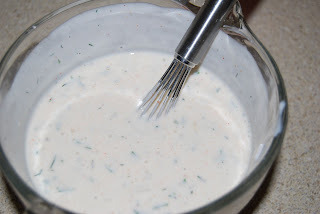 And I'm not big on ranch but I will admit a homemade ranch makes me want to lick the spoon. We've talked about joining a CSA but make weekly trips to the farmers market instead. Around here it seems that folks are getting all sorts of odd items in their shares – but loads of lettuce would make me happy!